Because the school district is a governmental agency, and the bus driver was driving a school bus, the court determined that the bus driver was engaged in a governmental function. Therefore, the plaintiff had to prove that the bus driver was negligently driving the bus. The plaintiff claimed that he was stopped at the light, and that the bus pulled up to his left and then turned right from a left-turn lane while the plaintiff was still stopped at the light. However, the court found that the plaintiff’s version of events was contradicted by other evidence. First, there was no traffic light or other traffic control device at the intersection, as evidenced by photos. Second, there was no “left-hand turn lane” at the intersection. Third, there was only one lane in either direction, which was separated by a double-yellow line. Finally, based on the photos of the crash, it was clear that the plaintiff’s car was in the intersection before it was hit by the bus. Because the plaintiff’s testimony was contradicted by the other evidence, the court disregarded the plaintiff’s testimony. The court then considered the bus driver’s testimony and the testimony of a police officer, who both testified that the plaintiff attempted to pass the school bus on the right, in a parking lane. The bus driver testified that she signaled she was going to turn, checked her mirrors, and slowed down before beginning to turn. The court explained that the bus driver could not expect the plaintiff to pass the school bus on the right. Based on this evidence, the court determined that the bus driver could not be found negligent, because she did not breach her duty to exercise ordinary and reasonable care while driving. The court also decided that, even if it did not completely disregard the plaintiff’s testimony, the plaintiff still failed to prove a negligence claim. The plaintiff did not claim that the bus driver had crossed into the wrong lane of traffic, and thus, the plaintiff had to have been in the parking lane. Therefore, the court found that the plaintiff was in an illegal lane of travel, and was required to yield the right of way. 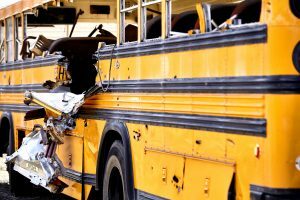 Accordingly, the plaintiff failed to show that the bus driver was negligent, and the school district could not be held liable. If you or someone you love has been injured in a Michigan car accident, you should speak with a knowledgeable personal injury attorney as soon as possible. The Neumann Law Group is experienced in personal injury claims and has settled millions of dollars in personal injury cases. Our law firm has over 200 years of combined experience, and we are dedicated to helping accident victims navigate the legal system. We represent injured individuals and their families in Detroit and throughout Michigan, as well as in Massachusetts and California. Call us at 1-800-525-NEUMANN or contact us online to set up a free consultation. Court Considers Claim Against Mercedes-Benz after Slip-and-Fall Accident at Detroit Auto Show, Michigan Injury Lawyer Blog, December 28, 2018. Pursuing a Personal Injury Claim after a Michigan Drunk Driving Accident, Michigan Injury Lawyer Blog, January 7, 2019.